Waiting on Wednesday is a weekly meme hosted by Jill of Breaking The Spine spotlighting upcoming releases. -I finished Once A Witch on Sunday and loved it. I can't wait to read Always A Witch. And even luckier, I just got it off of NetGalley! This cover is so..wow..intriguing! I am visiting through Follow Friday (even though its not Friday) and I am a new follower! Please follow back! Thanks and have a great day! Come by Attack of the Book and check out our WOW! I love historical stories, so this sounds perfect, plus it has a great cover. Thanks. If you're interested, here's my Wow picks. I definitely have to read Once a with, these covers are gorgeous !! Happy reading ! I just read this, thanks to Netgalley. It's such a great book. Hope you enjoy it! Great pick! 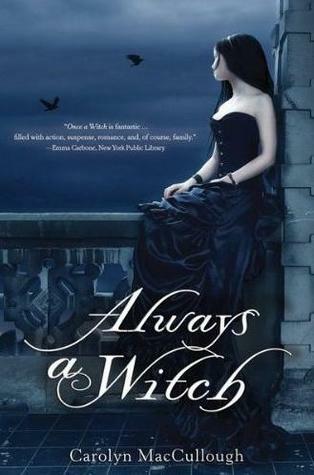 I liked Once a Witch, and I would definitely read its sequel, Always a Witch. Thanks to netgalley! Really like the summary on this one, guess I better check out book #1 before August. Great pick! I definitely want to read this one. I have gotten to first book so I can read this one. Nice pick! Sounds like you're onto a great series...nice pick! I want to read this as well. I hope when you get your books, it is everything you hope it to be. Check out what I am Waiting On Wednesday for. Sounds fun! My pick is about witches too. It's at The Crowded Leaf. I haven't heard of this or the first book, but they sound fantastic! I liked the first book and I have this waiting one in my TBR pile. I'm very excited. The cover for this one is gorgeous! Also I had lots of unanswered questions after Once A Witch, so hopefully this sequel will resolve those. At a time when most people have grown weary of the war between the states, two young children are desperate to find their way to the battlefields. Jeremy DeGroot wants nothing more than to join a troop as a drummer boy. For Dulcie, a runaway slave, freedom means she must head directly toward the fighting in the hopes that she'll become "contraband," that is, property of the Union troops. Both Jeremy and Dulcie find a place with the 107th New York Volunteer Regiment and even start to forge a friendship. But all that is threatened when they keep crossing paths with the mysterious Charlie, a young Confederate soldier, who may look like the enemy but feels more like a friend. Great choice! I have the first book in my TBR pile. I have to get to it soon! Here's my WoW. Once a witch has been on my too read list for too long, thinking I should make time to read it soon. The cover for this one is amazing! Here's what I'm waiting for this Wednesday! I am going to start this book soon, haven't read the first one which is a shame! I haven't read the first one, but it does sound like an intriguing series! i defnitely want to read this one!